The options for E-Merge may be set using the Options command under the View menu. By default, the E-Merge application opens to display the folder used before the application was last exited. If unchecked, the application will open to the system’s current folder. Before merging any data file into another, E-Merge checks for incompatibilities or inconsistencies (i.e., conflicts) between the two files (See E-MERGE: Conflicts During Merge Operations ). If E-Merge detects a conflict between a source file and a target file, a course of action must be determined before the merge operation may proceed. By default, if any conflicts arise during a merge operation, the merge process will be interrupted and the user will be prompted to determine a course of action. Negate the current merge operation. 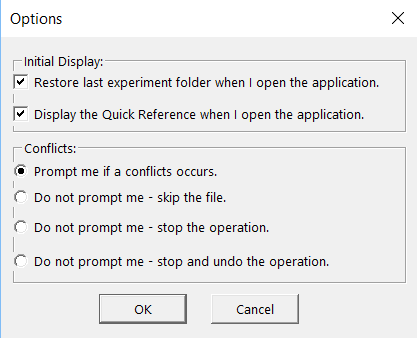 If the merge operation is stopped at the point of conflict, all files merged prior to the occurrence of the conflict remain merged in the target file. If the merge operation is negated, all files merged prior to the conflict are unmerged. In all cases, if E-Merge encounters a conflict during a merge operation, E-Merge will display the cause of the conflict and the course of action taken in the Merge Log view at the end of the merge operation.